The Pyramid of the Sun dwarfs all the other buildings in Teotihuacan. Like the Pyramid of the Moon, this massive pyramid is truncated at the top. Nearly 700 feet square at the base and in four terraces, it rises to over 200 feet. 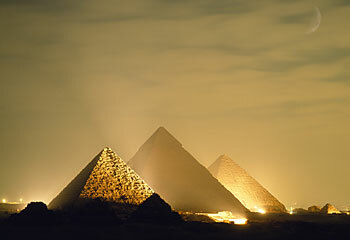 The faces of the pyramid were terraced by its builders to create the impression of even greater mass. The faces were also finished in stone with a covering of plaster, but the pyramid itself was built of adobe bricks. The Pyramid of the Sun gives the illusion of infinite height and space. Cunningly calculated planes between its terraces are so designed that an observer standing at the base of the great staircase cannot see people at the top. When the stair was used during religious ceremonies, the effect must have been stupendous; the onlooker would have been conscious only of the elaborate procession of priests and officials disappearing into space as they ascended the stairs to encounter, unseen by the congregation, the infinity of the universe, and to be concentrated at the peak under the god’s image. The Pyramid of the Sun is constructed upon a wide platform built of square cells. The platform is walled in adobe and filled with refuse and rubble. Ruins suggest that the houses of priests may have lain outside of the pyramid on the platform. Extending southwards, smaller groups of mounds are found, consisting of several priestly dwellings and a minor temple clustered around a plaza. In one of these groups the floors are of mica, of which the ceremonial significance is unknown. Across a river which ends in the south, lies a magnificent platform whose walls are faced with carved blocks and whose crowning pyramid temple has disappeared. It seems to have been built in honor of the rain god, Tlaloc, even though it is called the Temple of Quetzalcoatl. The plan of the sacred city of Teotihuacan was cunningly calculated to convey the illusion of massiveness and eminence. It was constructed with buildings grouped along a north-south axis, laterally interrupted by precincts of edifices oriented along the east-west axis. From whatever angle Teotihuacan was approached, the eye was tastefully led towards a point of interest, guided by the arrangement of the plane and mass. The diminishing effect of distance was thus avoided. Within the precinct, the surrounding walls insulated the observer from the rest of the city and consequently emphasized the enormity of the individual principal precinct temples. Not even the Pyramids of Egypt were so carefully and cunningly architecturally calculated to overwhelm the individual with the sheer, utter weight of supernatural power. One cannot escape the insistent association of ideas that the greater the temple, the more powerful the god for whom it was built must have been. Some time after the city of Teotihuacan was built, a mysterious renovation took place. Every building was rebuilt from the Pyramid of the Moon, at the north, to the Temple of Quetzalcoatl. Facades were covered up and rooms were filled into form plat forms for new pyramids. Not even the gigantic hulks of the Pyramid of the Sun and Moon escaped the addition of new stairs and facades. Strangely, the Temple of Quetzalcoatl underwent the most extreme alteration. This temple became the core for a high platform which supported a huge enclosure surrounded by a broad rampart. This rampart supported four lesser platforms on three of its sides. On the fourth side, the eastern wall, behind the main structure, three such temple foundations were built. Although the reconstruction eventually extended to rebuilding the entire religious center, no extreme shift in the styles of pottery or figurines suggests that the renovation was effected by another culture which had militarily conquered the Teotihuacanos. Instead, the new architecture has all the earmarks of a religious reformation which destroyed the symbolism of one cult to instill a new. In the neighborhood of Teotihuacan, some miles from the sacred city, tremendous communal dwellings were built, embracing fifty to sixty rooms set around patios connected by passageways. The rooms were built from adobe and rubblework, covered with plaster, and the inhabitants apparently enjoyed a life of comfort and security. There was also an altar prominently placed; religious rites were evidently not necessarily confined to the ceremonial site. Teotihuacan had a great and pervasive influence on all of its neighbors. This is evident in the Valley of Toluca, in Morelos, and abundantly in Puebla, where, at Cholula, the Teotihuacanos constructed an entire temple site of enormous extent. Excavation of this site has produced no carving as yet, but archaeologists have discovered one temple with a fresco decoration portraying the Butterfly God, a mythological being important to Teotihuacan religion. The majestic city of Teotihuacan was rebuilt two more times. The renovation probably fulfilled the ceremonial requirements of rebuilding and refurbishing at the beginning, or ending, of a fifty-two-year cycle. The third rebuilding was done hastily and with maximum use of the original construction. This final rebuilding introduced new gods to be honored and also heralded the end of the use of Teotihuacan as the sacred capital. The first people mentioned in the annals of the Valley of Mexico are the Toltecs of Tula, or master builders. These people appeared around A.D. 900 but their customs and achievements are so wrapped in the mystery which covers the facts of history, and so confusing and illogical are the references to them, that at one time their very existence was challenged j by archaeologists.